At the beginning of the twentieth century, there were a number of smaller religious bodies that sought to develop religious and national identity on the margins--something especially difficult when the nation was at war in South Africa. This book examines rich and varied extant sources that provide helpful windows into the wartime experience of Canada's religious minorities. Those groups on the margins experienced internal struggles and external pressures related to issues of loyalty and identity. How each faith tradition addressed those challenges was shaped by their own dominant personalities, ethnic identity, history, tradition, and theological convictions. Responses were fluid, divided, and rarely unanimous. Those seeking to address such issues not only had to deal with internal expectations and tensions, but also construct a public response that would satisfy often hostile and vocal external critics. Some positions evolved over time, leading to new identities, loyalties, and trajectories. In all cases, being on the margins meant dealing with two dominant national and imperial narratives--English or French--both bolstered respectively by powerful Anglo-Saxon Protestantism or French Quebec Catholicism. The chapters in this book examine how those on the margins sought to do just that. 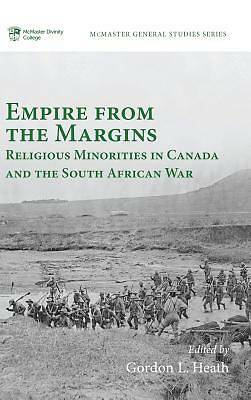 ""Gordon Heath displays strong historical insight in his recognition of the historical value of the responses of Canadian minority religions to British military imperialism in South Africa at the beginning of the twentieth century. Heath has gathered important studies of the Canadian religions on the margins of the British Empire and how they overcame their natural pacifism to believe that British dominion in South Africa would spread civilization and culture to the benefit of all nations."" --Terence J. Fay SJ, Toronto School of Theology, University of Toronto Gordon L. Heath is Professor of Christian History and Centenary Chair in World Christianity at McMaster Divinity College. He is the author of two other books on religion and the Boer War: The British in Our Nation: The BACSANZ Baptist Press and the South African War, 1899-1902 (2017), and A War with a Silver Lining: Canadian Protestant Churches and the South African War, 1899-1902 (2009).